When most freelance writers get started, they don’t often think about the legal side of things. Well, at least I know I didn’t. But the thing is, you’re a business now. You should treat yourself like one. This means, getting things in writing. Contracts can be scary things. But they can also be worth their weight in gold. Contracts are there to not only protect you as the writer, but to protect your client. In an ideal world, all clients would be honest and pay for your work (and pay on time!). While most do pay up, there are those unfortunate incidents where clients do their best to avoid paying. Without a written contract to back you up, it becomes your word against theirs. 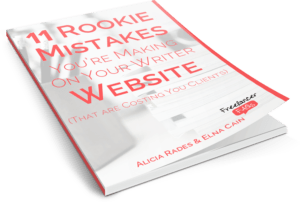 One day you may find yourself facing a client who hired you to write a blog post, and suddenly he’s asking you to not only write that post but to do the keyword research, find an accompanying image and upload it all to the dashboard. That’s not what you signed up for. Having a contract that lists your duties will back that up. While we hope you will never have to use them, contracts cover contingencies for your “worst-case” scenario clients. You can choose to include a contract kill clause (and even a kill fee), or outline the consequences for unpaid invoices. Good contracts are not only in place to protect the freelancer. They also are there to protect your client’s business as well. While you know you are trustworthy, some clients have also suffered unfortunate encounters and are wary about working with you freelancers. Your contract can cover the fact that the work you turn in will solely be yours or since you will be privy to some personal company information, you will not disclose any of it. Contracts are important part of doing business, but there are some freelancers out there who will tell you they are not necessary. In fact, some people think that pushing a legal contract will only scare off potential clients. Small jobs. For one time website content or a single editing job, a formal contract usually is not necessary. But use your judgment on this, since these smaller jobs can quickly turn on you if the parameters aren’t outlined. Jobs based on trust. If the client is someone you know personally or was recommended by someone you trust, again – use your judgment. How much will I stand to lose if this project goes south? How much liability is there in this project? If you decide not to get a contract, you should always get something in writing. An email stating the terms of the project with both parties agreeing to it can serve as an informal contract. I can’t stress to you how important this one is. Unless you clearly spell out what you will do, and for how much, things can change on your rather quickly. List what content you agreed to write, how many words, when it will be due, number of rewrites, etc. Be as detailed as possible. Don’t forget to include the deadline! This will cover your right to edit the terms of the agreement, payment and deadline if the scope of the project starts to change. Another important clause. Make sure that your prices are clear to avoid any confusion later on. With your fees in your contract, there is no way your client can come back and say you quoted a different price. Also, if you charge by the hour, state how long you expect the project to take. If it turns out it takes longer than expected … well that’s what the scope clause is for. Include your payment schedule. Even if you do not do partial payments upfront and total payment is due upon completion, you will want to include terms of your invoicing. When will you be sending an invoice? How long does the client have to pay it? Also, you may want to include how you want to get paid: check? PayPal? If the project suddenly gets terminated, will you charge the client for the work already done? For smaller projects this may not be necessary, but for larger ones you may want to include a kill fee. Until your client pays for the content, the rights to the work are yours. This means that until you are paid, your client cannot use it without your permission. On the other hand, once the client pays you, they are buying the rights to the work, which will ensure that they should not find the same content anywhere else on the Internet. In the freelancing world, contracts are a tricky thing. Some people are turned off at the thought of using them while others swear by them. Personally, I require them for all new clients. I’ve been burned before. If you don’t already have a contract template, here is a sample one you can use. Feel free to use it as is, add some clauses or take some out. Our gift to you! Corinne Kerston is a freelance writer and blogger for hire. She specializes in online marketing and B2B and B2C content. Her goal is to help businesses boost their exposure through engaging, well-written content. Find her at her website, or read her eBook Start Your Freelance Writing Career. For me, coming up with a contract was more of a ‘right, I should have done this sooner,’ kind of thing. And, becuase I’m an odd ball, I actually enjoyed writing the content for it. I think that “why didn’t I do that sooner?” reaction is one a lot of us have. I know I had it. I got burned by a client who pretty much refused to pay up. It was a learning experience I guess. Not a fun one, but an experience none the less. Thanks for providing everyone with a sample contract. I’m sure it will help new freelance writers develop their contract. Thanks again for contributing to FreelancerFAQ’s. Thanks so much for having me Elna!